The year 2014 in architecture involved some significant architectural events and new buildings. February 12 – Jang Bogo Station opens. date unknown – Infinity Tower, the tallest building in Brisbane, is completed. November 11 – Dr Chau Chak Wing Building, University of Technology, Sydney, designed by Frank Gehry, is completed. September 18 – Aga Khan Museum in Toronto, opens. September 19 – Canadian Museum for Human Rights in Winnipeg, Manitoba, designed by Antoine Predock, opens. December 13 – Halifax Central Library in Halifax, Nova Scotia, designed by Fowler Bauld and schmidt hammer lassen architects, opens. October 28 – Louis Vuitton Foundation in Paris, designed by Frank Gehry, opens. February – Taunusturm in Frankfurt opens. October – Tabiat Bridge in Tehran, designed by Leila Araghian, opens. August 29 – New National Library of Latvia building in Riga, designed by Gunnar Birkerts, opens. October 2 – Biomuseo in Panama City, designed by Frank Gehry, opens. July 21 – Philippine Arena, the world's largest indoor domed-arena, in Ciudad de Victoria, Bocaue and Santa Maria, Bulacan, is completed. Szczecin Philharmonic Hall, by Barozzi Veiga, is completed. November 23 – National Taichung Theater, by Toyo Ito with Cecil Balmond, is opened. Dream Dubai Marina, supertall skyscraper in Dubai, projected for completion. If completed before World One will become the tallest residential building in the world upon completion. 122 Leadenhall Street in the City. World Conservation and Exhibitions Centre, British Museum. August – 20 Fenchurch Street in the City of London, designed by Rafael Viñoly, completed. September 29 – Weston Library, a major reconstruction of the University of Oxford's New Bodleian Library by Wilkinson Eyre Architects, opens to readers. December 9 – University of Greenwich Stockwell Street Building, designed by heneghan peng architects (hparc), opened. London School of Economics Saw Swee Hock Student Centre, designed by O'Donnell & Tuomey. Burntwood School, Wandsworth, London, designed by Allford Hall Monaghan Morris, completed; awarded 2015 Stirling Prize. Everyman Theatre, Liverpool, designed by Haworth Tompkins, completed and awarded Stirling Prize. Lanarkshire, designed by Reiach and Hall (September). Oxford, designed by Wilkinson Eyre Architects (October). October 1 — Bill & Melinda Gates Hall at Cornell University is dedicated, designed by Thom Mayne of Morphosis Architects. October 9 – Windhover Contemplative Center opens at Stanford University. October 10 – 432 Park Avenue, the tallest residential buildings in the world is topped out. 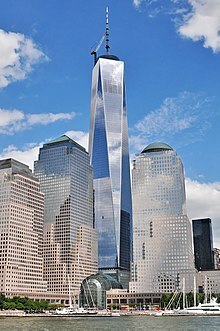 November 3 – One World Trade Center in New York City, designed by David Childs of Skidmore, Owings & Merrill with Daniel Libeskind, the tallest building in the Western Hemisphere, opens. One57, one of the tallest building in New York City becomes the tallest mixed-use (residential and hotel) skyscraper in the city. December 3 (ends May 2015) – "One Way: Peter Marino" at the Bass Museum in Miami Beach, Florida. ^ "14th International Architecture Exhibition". Retrieved 2014-06-07. ^ "Dr Chau Chak Wing Building". UTS. Archived from the original on 2014-10-24. Retrieved 2014-10-24. ^ Frearson, Amy (2014-07-11). "Rogers Stirk Harbour + Partners completes new conservation and gallery wing at British Museum". dezeen. Retrieved 2017-07-24. ^ Wainwright, Oliver (2015-09-02). "Carbuncle Cup: Walkie Talkie wins prize for worst building of the year". The Guardian. London. Retrieved 2015-09-02. ^ "Weston Library opens to academics after £80m revamp". BBC News. Oxford. 2014-09-29. Retrieved 2014-10-01. ^ "University of Greenwich, Stockwell Street Building". RIBA Awards. Royal Institute of British Architects. 2015. Archived from the original on 2015-07-22. Retrieved 2015-07-20. ^ Woodman, Ellis (2014-09-09). "Maggie's Lanarkshire by Reiach and Hall". Architects' Journal. ^ "Maggies Lanarkshire". RIBA Awards. Royal Institute of British Architects. 2015. Archived from the original on 2015-07-22. Retrieved 2015-07-20. ^ "The architecture and design of Maggie's Oxford Centre". Maggie's. Retrieved 2015-03-16. ^ "Philanthropist Bill Gates helps dedicate CIS's Gates Hall". Cornell University. 2 October 2014. Retrieved 28 June 2018. ^ "Windhover contemplative center opens Thursday on Stanford campus". Stanford – News. Retrieved 25 August 2017. ^ "Professor Ruan Yisan gets Reed Award". University of Notre Dame School of Architecture. Archived from the original on 2014-04-05. Retrieved 2014-04-05. ^ "Architekt Hans Hollein gestorben". Frankfurter Rundshau. 2014-04-24. Archived from the original on 2014-06-10. Retrieved 2014-06-07. ^ Colker, David (2014-08-28). "Kurt Meyer dies at 92; L.A. architect was committed to civic service". Los Angeles Times. Retrieved 2014-10-24.